"To All the Girls He's Loved Before"
The spotlight glows on center stage. The band vamps the familiar intro to "Whiskey River". Onto the stage steps Marion Deaton. As he takes the microphone and sings, "Whiskey River take my mind........", a restless energy sweeps over the audience. You hear the same thing being repeated all over the room! "He Looks Just Like Willie!" "Darn, He Sounds Just Like Willie!" It happens the same way every night, every performance, all across the country. This is Marion Deaton's tribute to music legend, Willie Nelson. Whether he is appearing on a national telecast or in a more intimate venue, men and women alike, are attracted by his laid back charm. 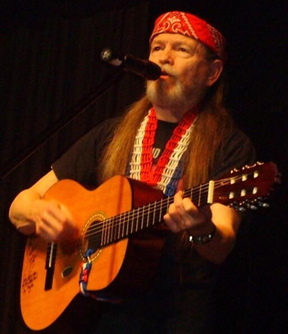 Marion recreates Willie Nelson's greatest hits spanning four decades of musical rebellion and excellence leaving audiences of all ages delighted!